EiceDRIVER™ 650 V Infineon SOI half-bridge gate driver IC with integrated Bootstrap Diode for IGBTs and MOSFETs with 0.36 A source and 0.7 A sink currents in DSO-8 package. 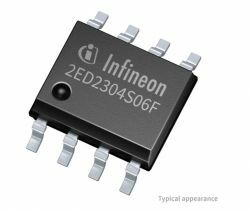 Using Infineon thin-film-SOI technology, 2ED2304S06F provides excellent ruggedness and noise immunity. The Schmitt trigger logic inputs are compatible with standard CMOS or LSTTL logic down to 3.3 V. The output drivers features a high pulse current buffer stage designed for minimum driver cross-conduction. The floating channel can be used to drive an N-channel power MOSFET or IGBT in the high side configuration which operates up to 650 V. Additionally, the offline clamping function provides an inherent protection of the parasitic turn-on by floating gate conditions when IC is not supplied.